If you are a Windows user tired of having to use iTunes to move tracks to your iPod shuffle, try out this small piece of software. iPod Shuffle Manager provides you the ability to use your iPod shuffle like a regular memory stick. 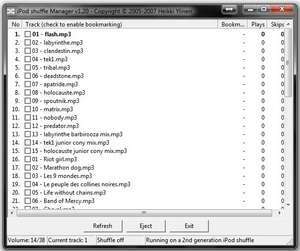 You can simply copy your tracks to the iPod shuffle as-is using Windows Explorer (or any other file manager). You may copy files from any PC. For security reasons, you should also check out the iPod Shuffle Manager download at LO4D.com which includes virus and malware tests. Additional screenshots of this application download may be available, too.